The visit by the mysterious North Korean visitor on Monday raises wide speculation about what China and North Korea are jointly planning ahead of North Korean leader Kim Jong Un’s summits with South Korean President Moon in April and with US President Trump in May. Information about the meeting is scarce. And the visit is probably best characterized as the convergence of Chinese desire to remain relevant and North Korean desire to manipulate US and China against each other. It is a direct result of the announcement of a Trump-Kim Summit earlier this month and reflects the Chinese maneuver to address the potential exclusion of China in a deal that could impact the future of not only the Korean Peninsula, but also the region. When news broke on March 8 that President Trump had agreed to meet with North Korean leader Kim Jong Un, the whole world was taken by surprise. In China, the announcement evoked two different reactions. Among Chinese foreign policy wonks, there was palpable anxiety over the perception that the Chinese government had been reduced to the role of an interested bystander and that its strategic interests would be sacrificed in the US-DPRK bilateral negotiations. Officially, China’s reaction appears to be much more positive. 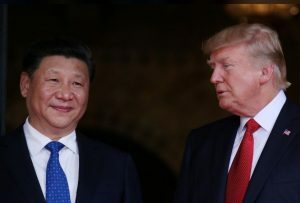 In President Xi Jinping’s phone conversation with President Trump on March 10, he hoped that “US and North Korea will initiate their engagement and dialogue as early as possible and strive for a positive result.” The Chinese Ministry of Foreign Affairs also issued a positive statement. The official position supporting a US-DPRK bilateral approach to solve the nuclear crisis appears to run counter to Beijing’s longstanding interest in a multilateral approach to conflict resolution on the Korean Peninsula, with China playing a prominent role. But appearances can be deceiving. The Chinese government sees key benefits for China in the de-escalation of tension. More importantly, Beijing is skeptical about the US and North Korea reaching a speedy and successful resolution in the forthcoming high-level summit. In light of this, China appears confident that its total exclusion from the process is unlikely. And the latest visit by the North Koreans was a testament to that. For a long time, China’s bottom line on the North Korea nuclear crisis swung between two anxieties. At one end is war anxiety: China is strongly averse to an armed conflict on the Korean Peninsula. President Xi himself had drawn “no war and no chaos” as a clear redline. With the Trump administration’s vigorous war preparation and its incessant and incendiary rhetoric about preventive strikes and giving North Korea a “bloody nose,” Chinese war anxiety grew to a fever pitch in 2017. At several junctures, especially after North Korea detailed its plan to shoot missiles near Guam in August and its successful test of the Hawsong-15 inter-continental ballistic missile in December, the Chinese policy community feared that military conflict between the US and North Korea was imminent. China’s war anxiety was so severe that it began to implement local contingency plans along the border and even started discussing contingencies with the US, a conversation that Beijing consistently refused to have in the past. China’s exclusion anxiety lies at the other end of the spectrum—a deeply embedded concern that North Korea and the US might engage in secret dialogues without China’s knowledge and reach agreement at the expense of Chinese national interests. Most importantly, Beijing is concerned with any concessions that North Korea might make toward the US in exchange for a US security guarantee, or a settlement that could lead to the unification of the Korean Peninsula by absorption and the emergence of a unified Korea as an American military ally on China’s border. The deterioration of relations between China and North Korea is a constant reminder of how Beijing aligned positions with Washington in the 1970s at Moscow’s expense. Beijing has oscillated between these two anxieties. When tension and potential conflict increase, China’s war anxiety becomes the key determining factor and de-escalation and promotion of direct engagement between Washington and Pyongyang is its top priority. When the possibility of direct US-DPRK talks increases, especially through backchannels and without China’s knowledge, Beijing’s exclusion anxiety rises and its concern about war temporarily abates. From the Chinese perspective, direct US-DPRK talks are expedient and convenient and spare China from Washington’s push to deliver more. It also protects China from threats of secondary sanctions when Beijing refuses to comply with America’s wishes. To minimize its responsibility, China has been keen to identify US security threats as the fundamental reason for North Korea’s nuclear brinkmanship. The logical consequence is that only a direct dialogue between the US and North Korea can address Pyongyang’s insecurity. The problem with this logic, as many Chinese scholars have argued, is that it defines China as an indirect and secondary player in the North Korea nuclear issue. By denying that China carries any direct responsibility for the creation of the problem, it morally and practically excuses China from having to take ownership of a solution. The side effect is that it also removes Beijing from any central leadership role in that solution, which may have a critical impact on the country’s security environment and national interests. To some, the self-denial of a central role is tantamount to Beijing willingly surrendering control of the situation to Washington and Pyongyang, whose preferences and decisions are quite likely to be against Chinese interests. The counter-argument since the last round of Six Party Talks in 2007 is that China can neither control North Korea nor America, so taking the driver’s seat in a stalemate or in a cross-fire is not only costly, but also unwise. The bilateral dialogues that China officially supports, from Beijing’s perspective, will hopefully initiate a longer process of nuclear and political negotiations with plenty of opportunities for a significant Chinese role and influence. In terms of economic considerations, China knows that the US is unlikely to be the sole provider of the incentives so essential to any deal between North Korea and the United States. It also believes that any arrangement to replace the 1953 Korean War Armistice Agreement will have to be approved and accepted by all the original signatories, therefore conferring a special status for China. China’s exclusion anxiety is also mitigated by a pessimistic assessment of the potential result of a US-DPRK summit. The United States and North Korea have engaged in similar negotiations before and the North Korean commitment to denuclearization is not fundamentally different from its previous position, which imposes conditions that the US needs to fulfill before Pyongyang gives up its nuclear weapons. North Korea’s status was written into the DPRK Constitution in 2012; and the precedent of former Libyan leader Gadhafi’s brutal death does not offer much confidence Kim Jong Un about a safe exit. On the US side, the Trump administration will be under serious political pressure to push for comprehensive, verifiable and irreversible denuclearization (CVID). Settling for anything less than that would be perceived as dangerous and politically costly. In other words, if North Korea’s commitment to denuclearization is bogus and the US bottom line on denuclearization is genuine, their conflict is irreconcilable and a deal is essentially an illusion. The second reason for pessimism lies in the nature of the North Korean regime. The DPRK’s top priority, in the view of many Chinese, is regime security and the survival of the Kim family rule. President Trump has demonstrated a strong interest in the human rights abuses and the brutality of the North Korean government. Not only did he honor a North Korean defector in his State of the Union address in January 2018, he also invited a group of North Korean defectors to the White House to raise the profile of the issue. An inflow of foreign information and influence is believed to be able to rapidly erode the foundation of the North Korean dictatorship, paving the way for the demise of the regime. It would take a lot to convince China that Kim Jong Un would allow this to happen if the Trump administration made a negotiating issue of North Korea’s human rights behavior. Finally, China’s confidence stems from its perception of geopolitics. In the Chinese view, the Korean Peninsula will always be located on the Chinese border and no country in the region can defy China’s economic and military power and political influence. Even in the case of a US-DPRK rapprochement, North Korea (and South Korea) will still be subject to the constraints imposed by Chinese power. Despite widespread anxiety among the Chinese public and policy wonks about China’s exclusion to date from the summit process, Beijing appears to be relatively complacent, although it does take credit for the summit and for the de-escalation of tension in the region. There are several reasons for Beijing to welcome and support the summit decision. For instance, it almost immediately eased China’s anxiety over a potential war and mitigated US pressure on China to deliver more on North Korea at the UN Security Council. For the time being, the US threat of secondary sanctions has become a non-issue. Nonetheless, the anxiety about being sidelined or marginalized is still rampant in the Chinese policy community. It is mitigated, however, by what China sees as a long and difficult journey between the summit and the solution of the North Korea nuclear issue. The event itself, in Beijing’s estimation, will not change the fundamental issues or conflicts of national interests in the region. In short, it will not be transformative. Therefore, China will exploit all potential opportunities to exert its influence on the outcome of the summit and to play a significant role in any negotiating process that might emerge from the meeting. In this sense, the visit by the North Koreans to China on Monday seems the most conspicuous move by Beijing to get itself back to the table.